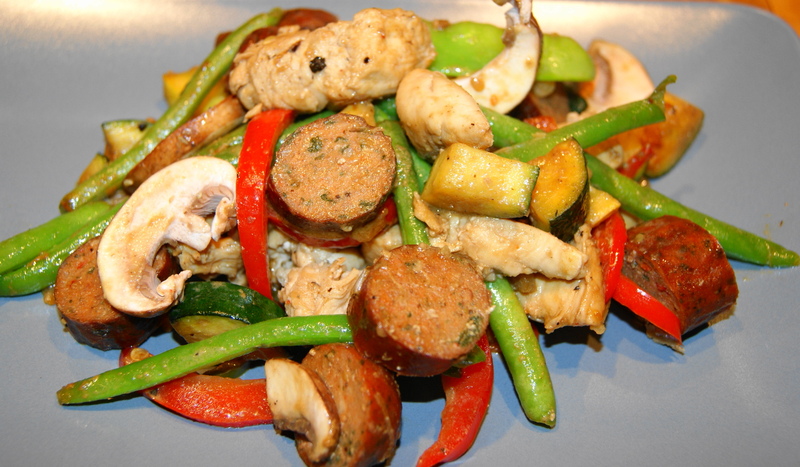 This is a different twist on the sauce for your typical stir fry using a little tahini to thicken and flavor the sauce. As with any stir fry this is a chance to clean out the refrigerator and that is just what I did. For this version I did add some leftover chicken sausage as well. Feel free to add everything you need to clean out and for sure try this sauce, it was delicious. Heat oil in a wok or large skillet. Add the onion, red pepper, and jalapeno and cook until the peppers begin to soften. Add the green beans and cook for about 3 minutes, stirring often. Add the zucchini and squash and cook for about 2 minutes. Season with five spice, salt and pepper. Remove to a serving bowl. Add olive oil and heat. Add the chicken and cook until cooked through. Season with salt and pepper. Remove to the serving bowl.